Onto the wall... I'm not a Byakuya fan (Renji <3) but I'm dedicating this one to all the fangirls (Tate? :D)/boys out there lol. All started off with the Soul_Society Livejournal community contest I won. I received a Japanese magazine where there was a nice picture of Byakuya that screamed to me "vector me oh great sandy!" XD Click here for the original scan I made. Now onto the scene itself. When I saw the picture, I knew right away what I wanted to do with it. Something simple and pure, I wanted to make it exactly like his shikai performance in the anime with no painted background to give it a dramatic aspect. Just Byakuya and his zanpakutou surrounded by "sakura petals". I gave it a few more FX to make it more spiffy (fog, glowing aura, rays of light, reflection of the sword in his eyes, etc.) and decided to make it "in the process", that is not with the blade completely disappeared, to have a dynamic scene. I used different photoshop textures to fake the reiatsu ("spiritual pressure"), all for the dramatic effect's sake. I placed the petals with parsimony to not break the balance of the composition. About the title (which is the actual summoning sentence "Chire, Senbonzakura"), I would have, at first, placed it bottom middle but I think I did this too many times before so I've decided to use the fact that Japanese writing can be used vertically to place it at a perfect place to the left (it gives balance to the composition, the scarf on the right side dividing the space in two). this is great! i love how you vectored and i love the purple glow! Pretty awsome work. Going from an orange-based image to a full-color vector...and the petals along with the effects are pretty awsome as well...I'm not a Byakuya fan (in fact, I pretty much hate the guy...) but this is some top-quality work. Hmm.... no wonder I saw lot's of your walls popping up like crazy over ap... ^_^ Anyways, me love it! Even though purple got to be one of my least favorite color (somehow it remind me of Orochimaru... *shudder*)... this one is kinda nice. Hmm.... already add a favs! Muahahaha!!! I'm .. in .. LOVE! Oh my gosh what a beautiful wall! I like the purple in this pic! It makes it seem so . . silent. I love silence! Great wallpaper! Wow this is really ridiculously good.. I've admired your earlier submissions and was actually wondering why you hadn't submitted in a while. *gawking* I love the effects you've created. I usually try to give suggestions but really don't have anything to say here. ^^; This is really a job well-done. 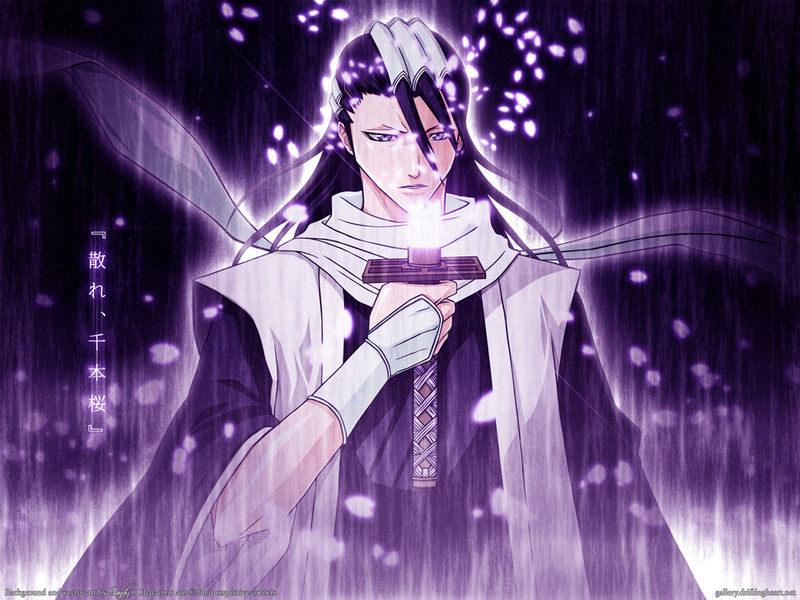 Wow, this is just amazing >_< i love byakuya! He's my favorite! This is such a gorgeous image =] Thank you very much for sharing your work.